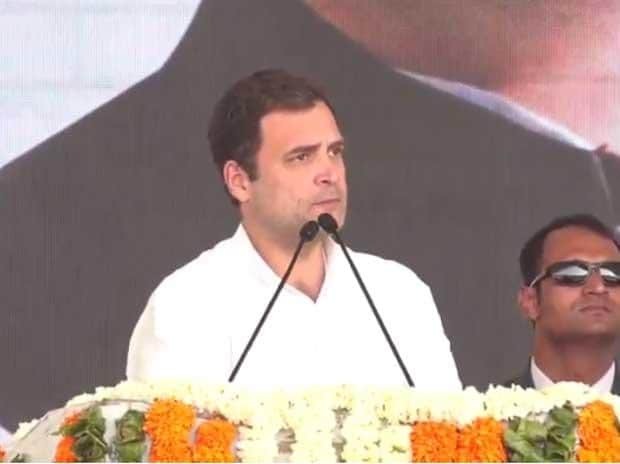 Congress president Rahul Gandhi on Friday lashed out at both the Narendra Modi government at Centre and the Naveen Patnaik led Biju Janata Dal (BJD) government in Odisha, accusing them of sharing a mutual partnership. Gandhi alleged Modi was remote controlling the corrupt Patnaik government seeped in corruption. “The chowkidaar is certainly the chor.... there's no doubt about it. But there is a lot of theft in Odisha too. In Delhi, there is the chowkidaar and here, there are ministers embroiled in the chit fund scam. The government in Odisha is in the grip of the chowkidaar. When chowkidaar presses the button, Naveen Patnaik wakes up and then he goes into the sleep mode. When Modi has to pass a Bill (in Parliament), he presses the button again”, Gandhi said in a fiery tone at a public rally at Tamando, on the outskirts of Bhubaneswar. The whole country is aware of the disasters of demonetisation and 'Gabbar Singh Tax ' (GST) but Patnaik complements the Modi government for his compulsions, the Congress scion rued. Gandhi went on to say that the Naveen Patnaik government was under duress from Modi to camouflage its corruption. Continuing his tirade against both Modi and Patnaik, the Congress chief alleged the two leaders catered to 15-20 rich industrialists, allowing them to accumulate wealth to the detriment of the poor farmers. “Both Modi and Patnaik share the same ideologies- to capture 15-20 industrialists, hand over all wealth to them, engage them for marketing and run the government by bureaucrats. All the benefits accrue to the wealthy industrialists while farmers and the poor people suffer. The Narendra Modi government has waived off Rs 3.5 lakh crore of loans in favour of the 15-20 industrialists”, he said. Gandhi flayed the BJP and RSS for spawning hatred in the country by pitching Hindus against Muslims and North Indians versus the South Indians. “The Modi government can't offer employment to the youths, to the farmers, they offer no relief”. The Congress promised a decision on farm loan waivers within 10 days in Madhya Pradesh and Chhattisgarh but we fixed in two days, Gandhi asserted. He acknowledged that Odisha wasn't a poor state though her people were poor. Should the Congress party be voted to power in the state, it would waive off farm loans and announce an MSP (Minimum Support Price) of Rs 2600 for paddy, higher than Rs 2500 which the newly installed Congress government in Chhattisgarh had done. Gandhi credited the Congress for Green Revolution in Punjab and Haryana that helped the country achieve self-sufficiency in food grains production. “We want to repeat the same feat in Madhya Pradesh, Chhattisgarh and Odisha. We will set up food processing plants in every district of Odisha”, he said. Turning to Odisha's sordid healthcare infrastructure, he said,”Odisha is one state where a tribal man is forced to carry his wife's corpse and trudge 10 km. And, Naveen Patnaik makes lofty claims on the state of hospitals and healthcare in the state”. Sharpening his attack on the Odisha government, he questioned how many irrigation projects have been initiated by the government in the last 15 years. “Odisha's potential has not been tapped by the Naveen Patnaik government in the past 20 years. You have water, land, forest and natural resources- no dearth of wealth. But your wealth, natural resources and electricity are snatched from you to serve the interests of others”, he told the gathering.